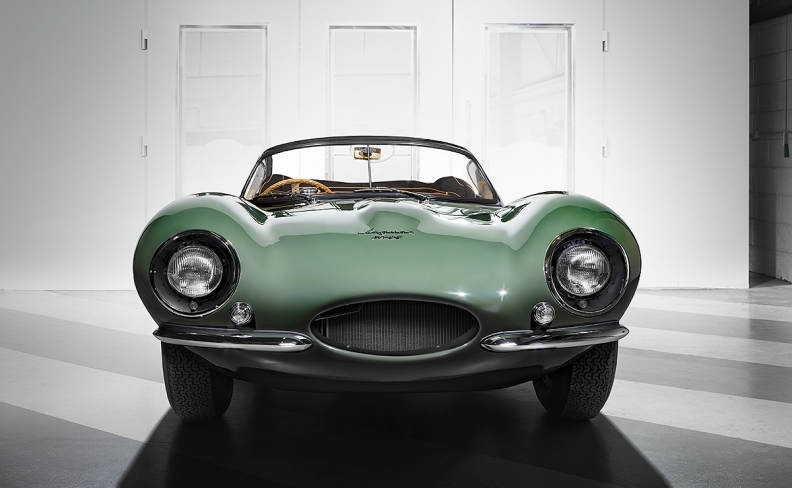 In creating the XKSS, the team at Jaguar Classic used original drawings from company archives and supplemented them with modern tech, such as scanning the car to build 3D models to aid fabrication using retro, authentic methods. LOS ANGELES -- Jaguar's new supercar has been 60 years in the making. Don't expect paddle shift, ABS, or even the luxury of electric windows. As well as a vintage look, the XKSS has vintage features to boot. It's technically a "continuation car," a special type of replica in which production ceased but has since restarted using original designs and methods (like this Superformance MKII Slab Side Cobra or Jaguar's own Lightweight E-type). The original XKSS was made for the U.S. market as a road-going conversion of the Le Mans-winning 1954 D-type, until a fire ripped through Jaguar's Browns Lane factory in 1957. As a result, only 16 were ever made out of the total 25-car production run. Unsurprisingly, the cars that survived fetch a pretty penny these days. Steve McQueen owned one that's estimated to be worth up to $30 million. The new XKSS model was revealed on Wednesday at the Los Angeles auto show, a one-off that comes off the back of 18 months of research and build. It will be used as a blueprint for the nine collectible units that Jaguar will start to make in 2017. According to Kev Riches, engineering manager for Jaguar Classic, a branch of the company that focuses mostly on refurbishment and maintenance of classic Jags, the XKSS project is all about replacing those nine vehicles that were lost in the fire. "For me it's almost about re-creating a piece of art," he said. "Being a real petrol head, it was about building an authentic car and trying to make the cars as accurate as possible to the cars that were built in the period." The team at Jaguar Classic used original drawings from the company archives and supplemented them with modern tech, such as scanning the car to build 3D models to aid fabrication using retro, authentic methods. Steel and aluminum panels were hand-rolled on English wheels as they would have been in 1950s. Some nuts were even reproduced because they can no longer be bought. "It was about trying build that perfect car to the period specification, in the period way as much as possible," said Riches. Under the hood, the XKSS has a 3.4-liter straight six-cylinder engine with 262hp. The company says everything from the wood of the steering wheel to the leather of the seats and the brass on the dash is exactly as it would have been in 1957, with only minor changes made for 21st century safety requirements. The nine cars due to be built sold out almost immediately to a selection of international buyers. Riches estimates each model to have sold for around $1.5 million.